Thinking of adding birch tree wallpaper to your space, but worried the trend is over? My customers certainly don’t think so since this black and white birch tree wallpaper is one of my most popular patterns (maybe it’s a trend-turned-classic?). 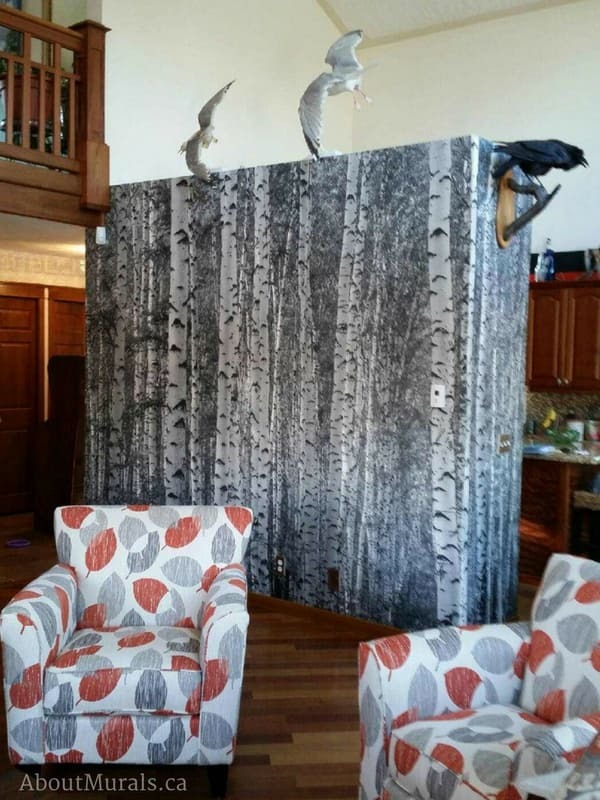 So how do you know if birch tree wallpaper is for you? Wanna see it in action…in real people’s homes…and not those boring stock photos? I spend hours every month asking for photos of my wall murals from my customers so that you can make a better informed decision whether it’s for you or not. 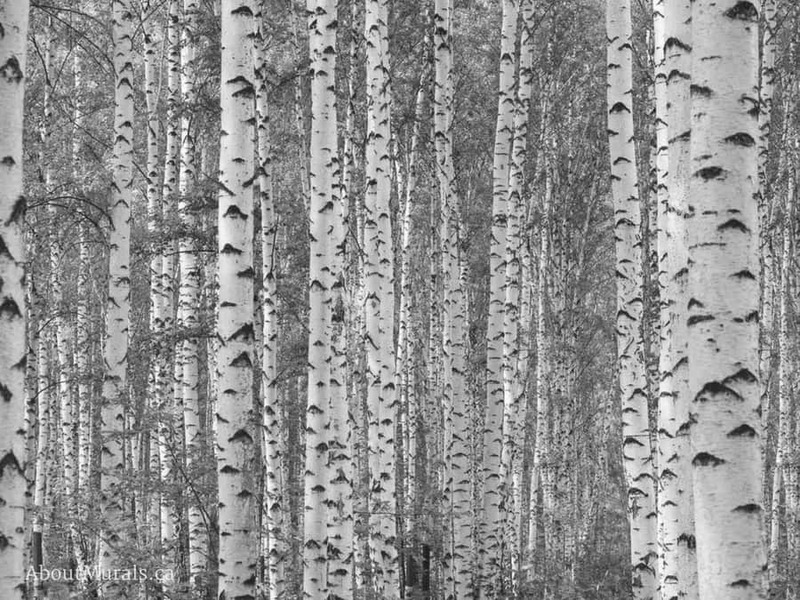 Scroll down for a ton of birch tree inspo! 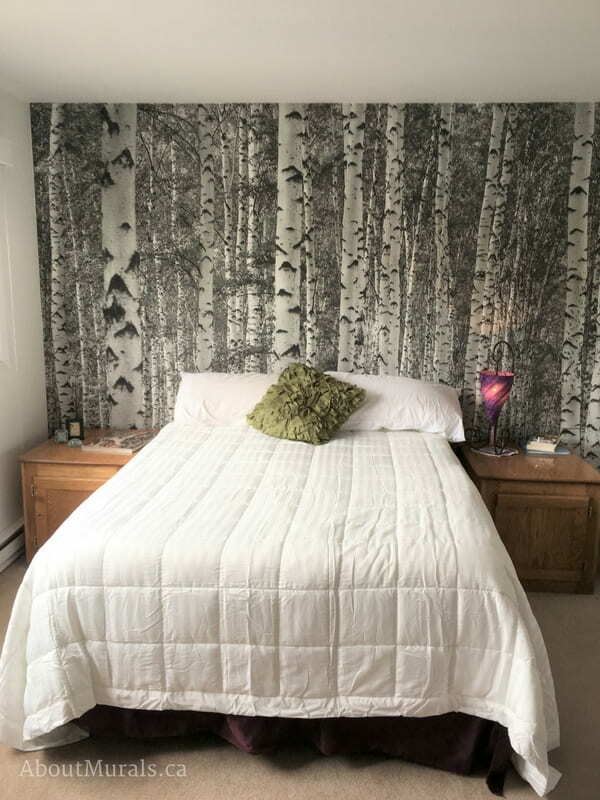 Birch tree wallpaper…that’s actually a mural…so no repeat patterns! Here’s a stock photo of the actual (totally boring…*sorry*) wallpaper. But what you CAN see when there’s no furniture in the photo, is that there’s NO repeat pattern to this wallpaper. That’s because it’s actually a wallpaper MURAL created from a photograph – so it actually looks like a forest! 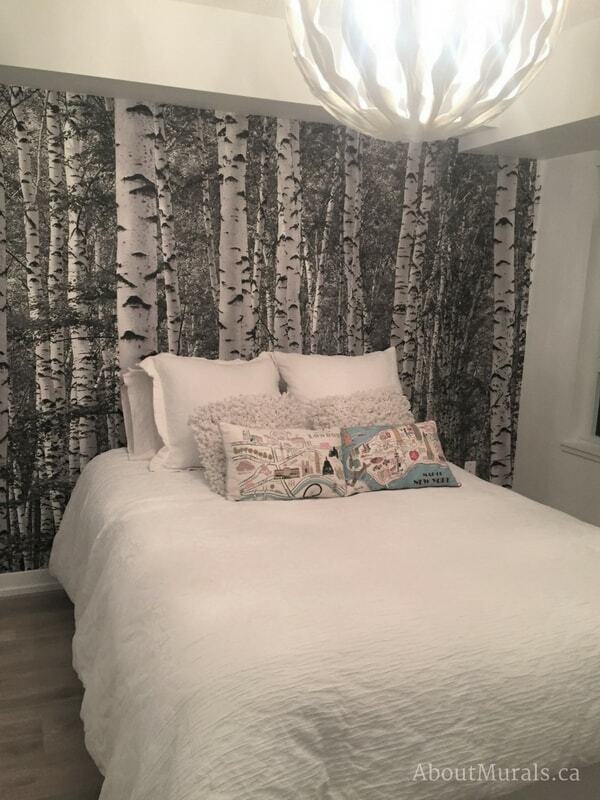 Keep on scrolling to see how my customers used this birch tree wallpaper to make really cool spaces. It’s super easy to hang! All of my wallpaper murals are super easy to hang (for all my DIYers out there!). I even made a how-to video to help you along. BUT if you’re not the DIY type and you live in Southern Ontario, I do offer wallpaper hanging services. 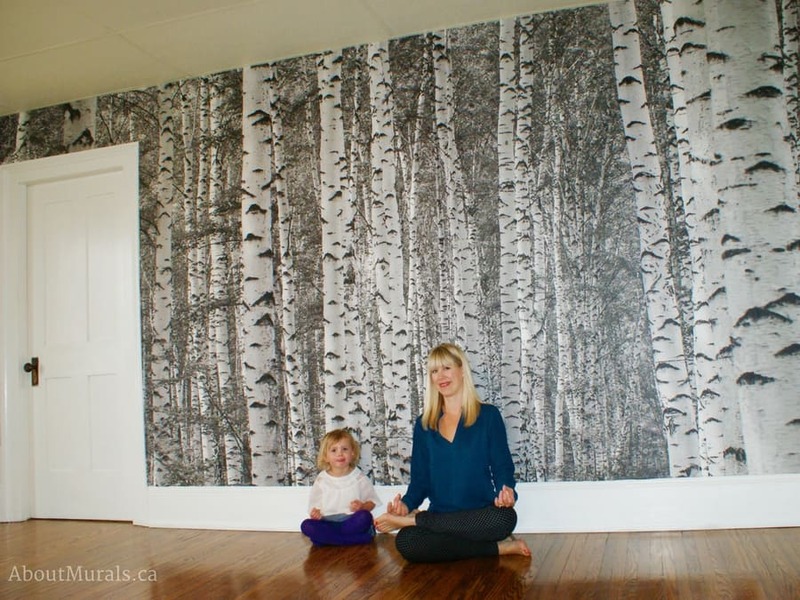 Merissa from White Birch Massage ordered my birch tree wallpaper and had me hang it in her yoga room. She was renovating the entire spa and didn’t have time to hang it herself. And yup – that’s me with my daughter, Audrey! 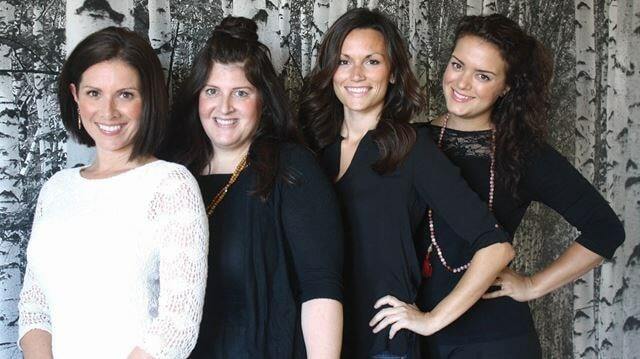 The perfect social media backdrop! Merissa and her staff were even featured in the local newspaper with the birch tree forest wallpaper in the background. So cool! As a yoga studio, where people constantly take deep breaths in, you’d want a wallpaper that doesn’t affect the air quality. Come to think of it…you’d want this for any room in a business or your home, right? All of my wallpaper murals are eco-friendly, making them safe for any space. 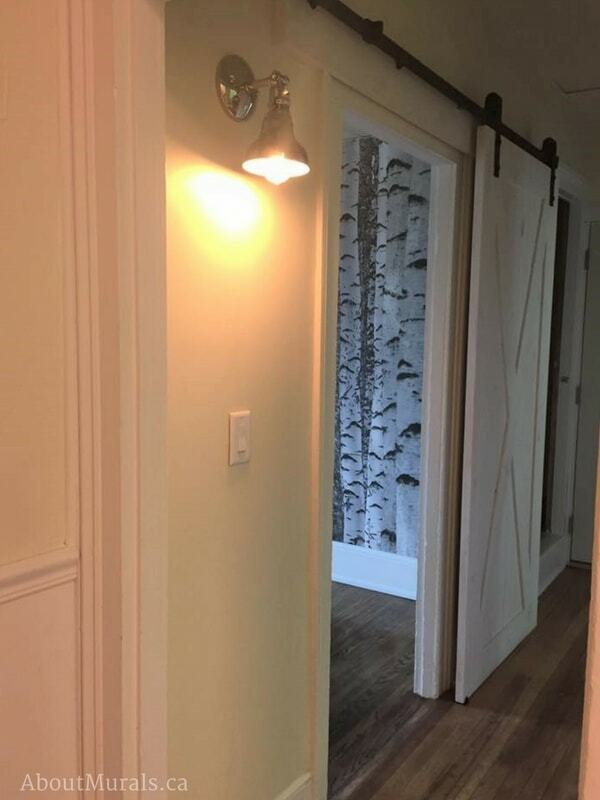 Here’s a peek of the wallpaper from a hallway at the White Birch Massage Therapy Centre – what do you think of it mixed with the barn door? Shop all my Birch Tree Wallpaper! Lisa had a wall separating her living room from kitchen and was looking for a dramatic way to decorate it. I hang my wallpaper murals like this on TV sets all the time. Usually, I “wrap” the wallpaper over the top of the wall, but you can also trim the excess off if the top of the wall is really straight and level. It makes a room feel BIGGER! I think there is sometimes a misconception that a mural in a small space will make it feel cramped, but I think (especially with a forest wallpaper), it adds depth because it feels like you can just walk right into it. Tonja wanted to make a light and airy bedroom with lots of white and hints of black. 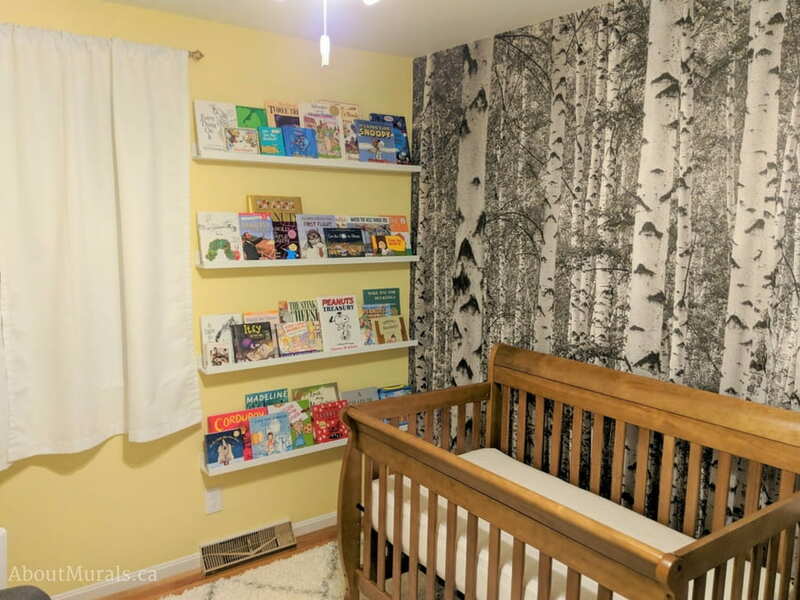 What d’ya think – does the black and white birch wallpaper make the space feel cramped or deep? An article on AskDrSears.com says that “The best way you as a parent can stimulate baby’s vision is using black and white…contrasting colors.” Just imagine the effect Beth’s baby is getting when she sits in the nursery or her baby is in the crib. Wow! One of the biggest fears I hear about wallpaper is that it’s brutal to take off the wall when you’re done with it. All of my wallpaper murals are totally removable. Just pull it off the wall! I even made a how-to video explaining how to remove it. This bedroom features the birch forest wallpaper, only this time it includes a bit of colour (a throw cushion, bedskirt and candle holder). That’s the beauty of this design – the black and white allows you to pull in some colour. Have you thought about food splatters on wallpaper that’s in a dining room? All my wallpaper murals are washable, so any food splatters can be wiped off with a damp cloth! So what do you think of this black and white dining room? Still not convinced? Grab wallpaper samples! Seeing my customer’s photos on the screen is one thing. But maybe you’re the type who needs to see it in person? 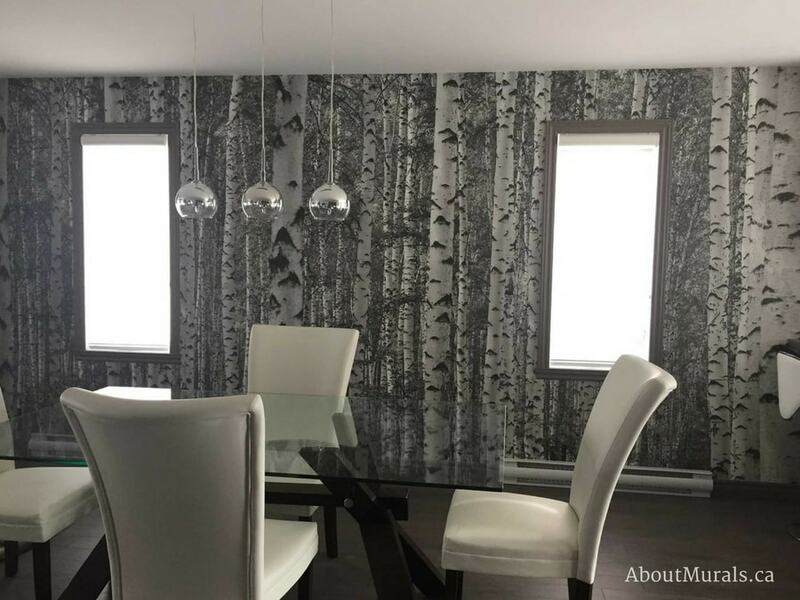 You can buy a wallpaper sample of Birch Tree Wallpaper (Black and White) so you can see if the colours match your décor and to feel the quality of the paper. 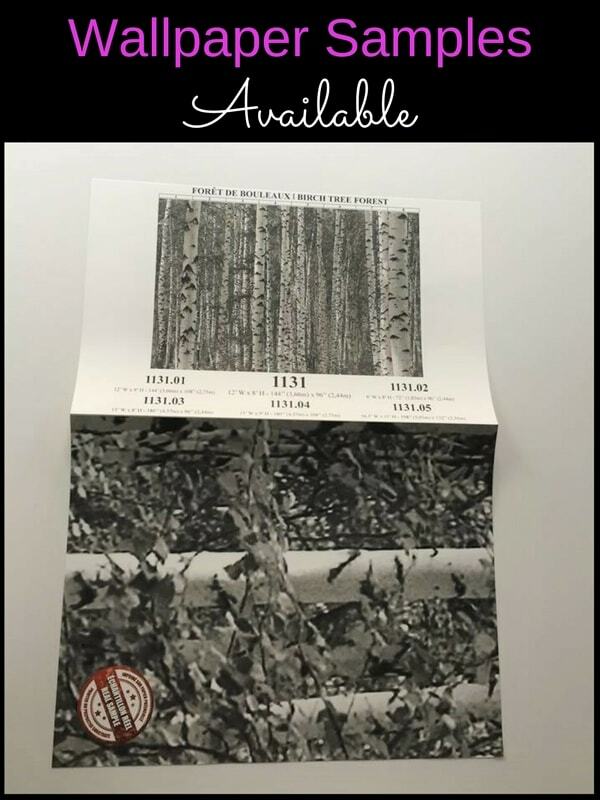 Looking for a hot deal on birch tree wallpaper? Join my newsletter community and you’ll hear about all the latest sales (including any Tree & Nature Murals), extra hot coupon codes and see more inspirational customer photos. Hi, I enjoyed reading and looking at the beautiful birch tree wallpaper. I’m moving soon and I’m so excited to decorate. I like grass wall cloth, color is celry, paint will be be warn green with grey in it. So yes I love new decorating ideas! Hey Roberta! Ooh…your project sounds so organic and natural. Thanks for sharing your ideas!